cut files Archives - Pebbles, Inc.
Hello Pebbles fans! 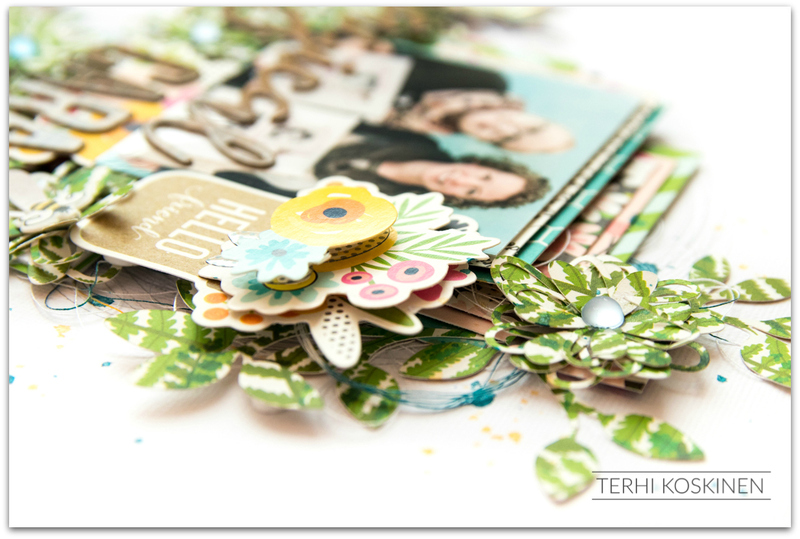 Terhi Koskinen here to inspire you with another baby-themed layout. Let’s continue the fun journey with cut files too! A week ago, I was here talking about sewing cut files onto scrapbook layout. Today we’ll keep talking about cut files with another idea on mind. 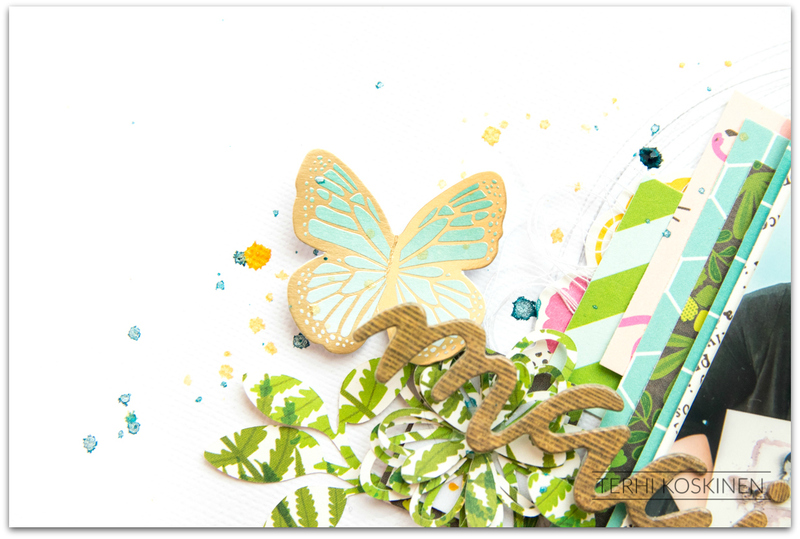 The large butterfly cut file is from Paige Evans’ Facebook group called ‘Paige Evans – Happy Scrappy Place‘ where Paige herself is sharing inspiration, hosting challenges and sharing free cut files every week. 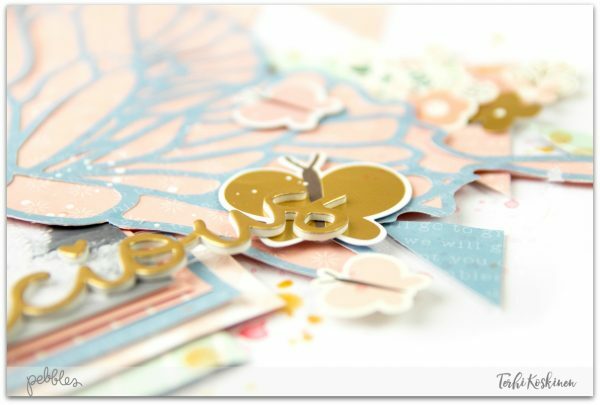 You can cut the butterfly as a teeny tiny small embellishment or make it a focus point on a layout like I did. I actually cut it twice. First I cut it with all the holes and details. Next, I cut just the outer edge and glued these two on top of each other. This is definitely the easiest and quickest way to get familiar with the backing technique. If you want to take this technique to the next level, back the holes separately with different patterned papers – time consuming but SO worth it! This tender and sweet layout wasn’t right spot for heavy mixed media, but I wanted to have something small on the background. That’s why I ended up cutting small triangles. To begin, I first cut a piece of patterned paper to 2″ square, then cut it half on the diagonal. I used these triangles here and there, adhering each one in place with foam tape to make more dimension. If you look very close, you can spy a couple of golden spots here and there. I love using watercolors and mists (or actually any liquid media) to give the perfect touch to all my layouts. For this layout, the gold color was a good choice as the title is golden as well. 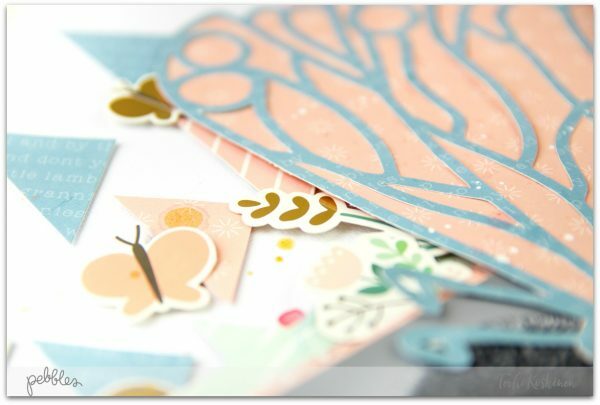 Small butterflies, flowers, blooms and leaves are both from the ‘Night Night’ ephemera pack and sticker sheet. The stickers are flat, so I repeated the foam tape trick to make them pop up. 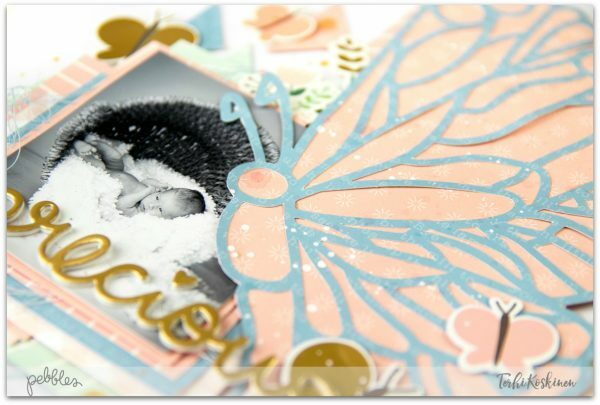 After this baby girl page, I’m inspired to do another with a boy theme! Fortunately my sister has a boy, so I’m off to search for the perfect baby boy pictures from her drawers. Can’t stop loving ‘Night Night’! Hope you are inspired, and thank you so much for stopping by today! 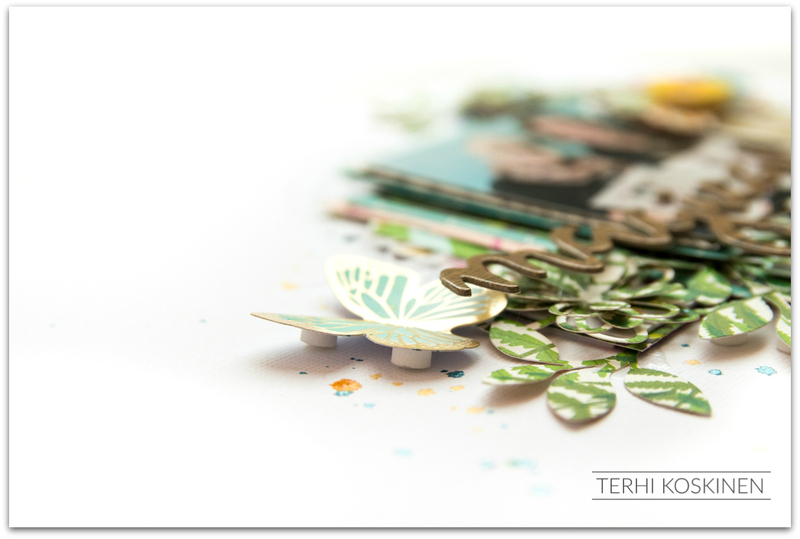 Hey there Pebbles Fans, it’s Terhi here sharing some scrapbook-love around the globe! 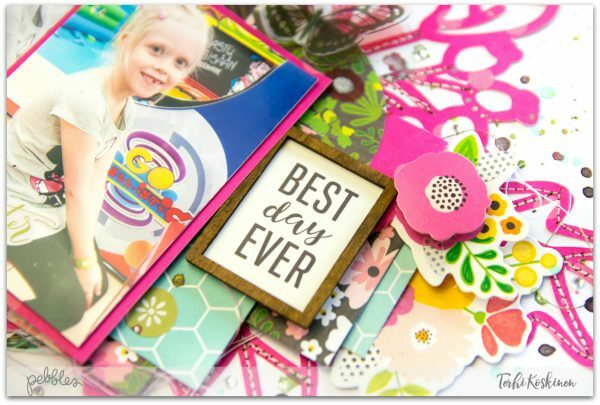 I often find myself scrolling through social media and feel so inspired by all the wonderful scrapbookers and other crafters. 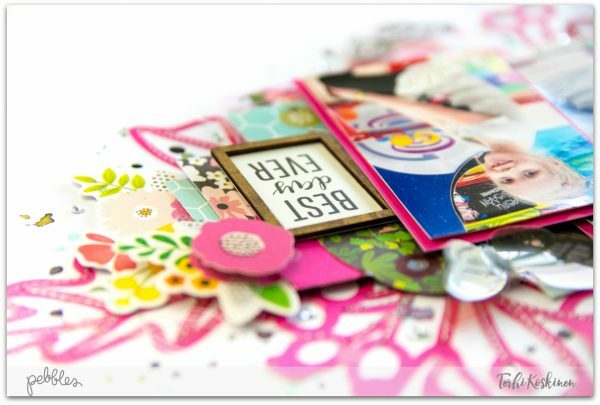 This time the scrolling lead me to Paige Evans’ new Facebook group called ‘Paige Evans – Happy Scrappy Place‘ where Paige herself is sharing inspiration, hosting challenges and sharing free cut files every week. 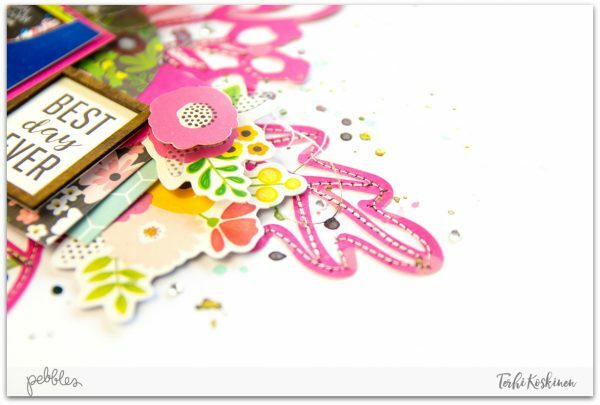 I picked up this wonderful flower bunch cut file, said thank you to Paige, and cut it out using my favorite hot pink patterned paper from Patio Party collection. Thinking of several ways to use the cut file on the layout, backing it, using it as a stencil or then let it be as it is, I finally came up with an idea of stitching it on the background! If you haven’t used your sewing machine for a while I personally recommend something easier to start with, but of course I found myself doing this tricky cut file and in the end it took one and half hour to finish the job. But it was worth it! To make sure the hard work of stitching will be visible, I kept the other thread dark brown. This way it peek just a bit from each hole on the layout, and the stitching can be seen much easier. The bloomy background was wonderful way to start this layout of my younger girl who’s first year in school is about to end. Something to celebrate! 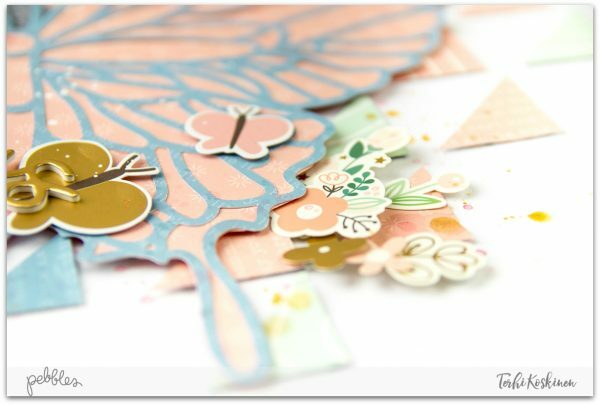 There’s some patterned papers making layers behind the photo, and some sweet embellishment like the dimensional butterflies. Hope you’ll try out stitching on a layout, it’s fun! Thank you so much for coming here today and have a happy day! Hello lovely Pebbles fans! 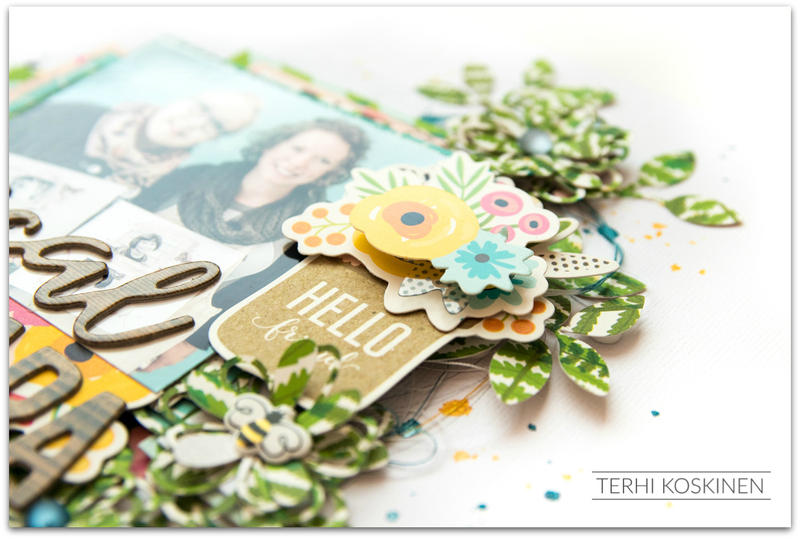 Terhi Koskinen here with a fresh green scrapbook layout cherishing the memories of meeting long time online friend finally in real life. Last spring I was invited to teach scrapbooking to Paris, and as my sweet friend Cara lives close to France, she took a train and traveled to meet me. Happy memories, as this is, needs to be scrapped with cheery colors, fun and happy elements. 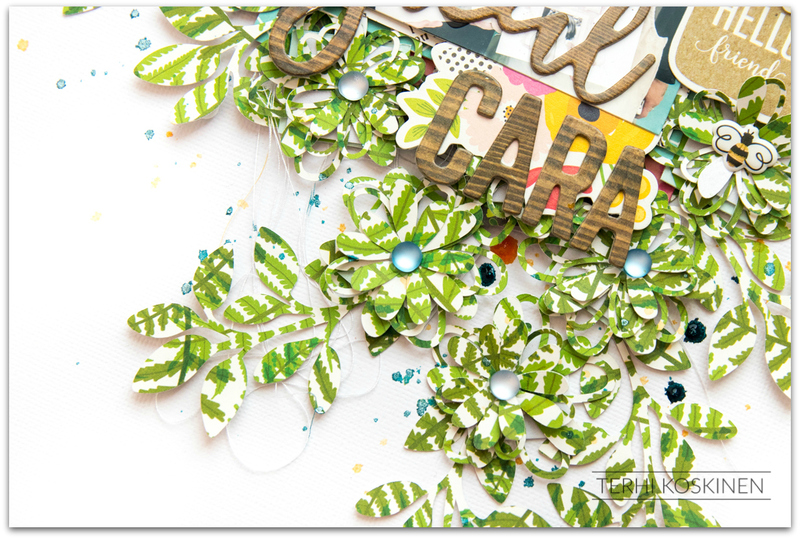 I chose my very favorite paper ‘Ferns’ from Patio Party collection and used my electric cutting machine to cut out lots of simple flowers and leaves. The cut files I used are free from internet, searching the word cut file via Google gives you thousands hits. I started creating the layout by designing roughly were to set the photo, which title to use and how to use all the flowers. Then the idea of layered blooms came to me. I took about four to six different sized flowers and glued them together adding the glue only to center of each one. Then I fold the petals a bit higher to make the layers visible. Couple of my first trials ended up to trash bin because I was too generous with the glue, but in the end I had eight big blooms to play with. Last but not least I wanted to raise up the embellishments with only one layer, too. I added Sticky Thumb Foam Dots under the butterfly, and also under the leaves. 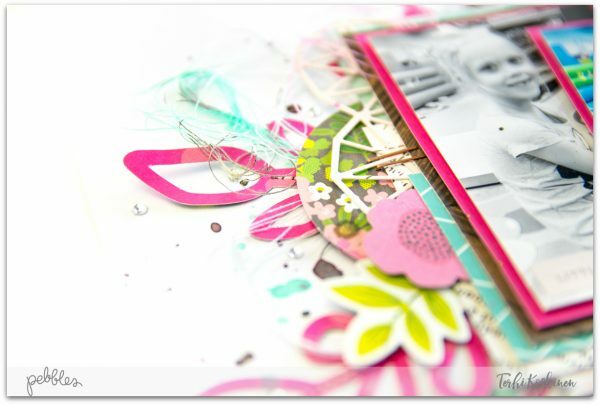 I’m almost addicted to have shadows and dimensional elements on my scrapbook pages! Here you can see the adhering. These small dots are perfect to use, so tiny and the quality of the attachment is really good – sticky just as the name says. Hope you find layering as fun as I do. Thank you so much for coming here today and have a happy weekend! Hi Pebbles Friends & Fans! 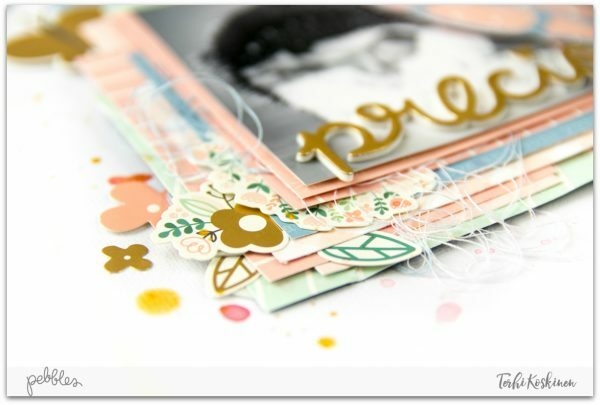 Amanda here, & I am delighted to be sharing something new and a little close to my heart today! The all new Pebbles Night Night baby collections are so dreamy, delicate and divine! And lucky, lucky me, as only 2 months ago we welcomed a new nephew into our family! He is the most darling little cherub ever! Today I am sharing some of those first cuddles & night time snuggles moments with our Night, Night baby boy line. SO precious! Oh isn’t this just swoon worthy?!! Told you it was close to my heart! I don’t know what melted my heart more – our new baby nephew or the love that my five year old son had for him! You can see how perfect & delicate this collection is for all our babies! Oh how I love newborns!!! 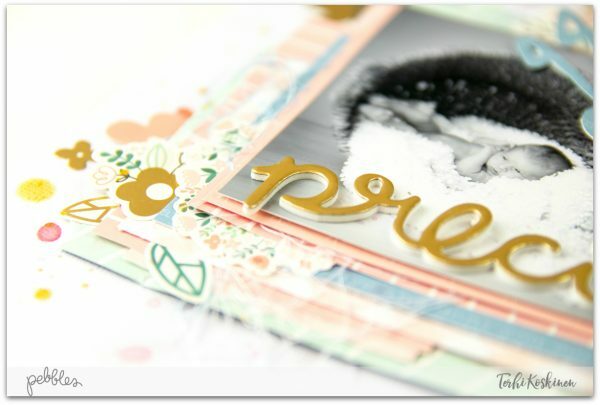 But enough goo-ing and gah-ing from me, here’s how I created this beautiful newborn page….. 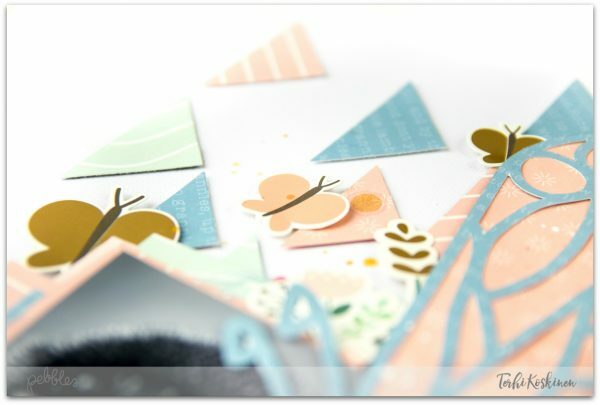 I started by looking through all the PRINTED CARDSTOCK SHAPES, and despite all the sweet sail boats & ocean friends, I just couldn’t go past the clouds! 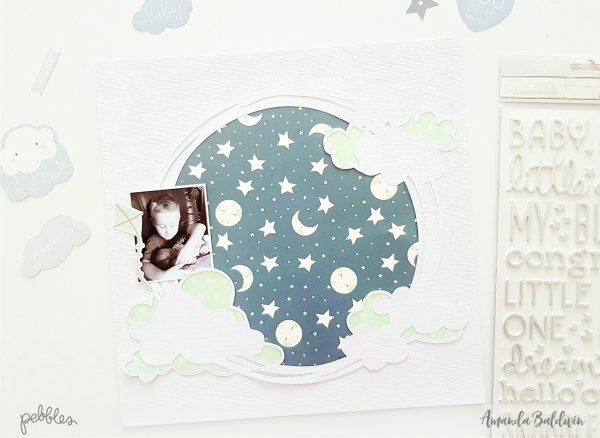 Clouds are so dreamy, & when I laid eyes on pattern paper, SWEET DREAMS, I knew I was going to create a sweet nighty, night and lullabies inspired layout. 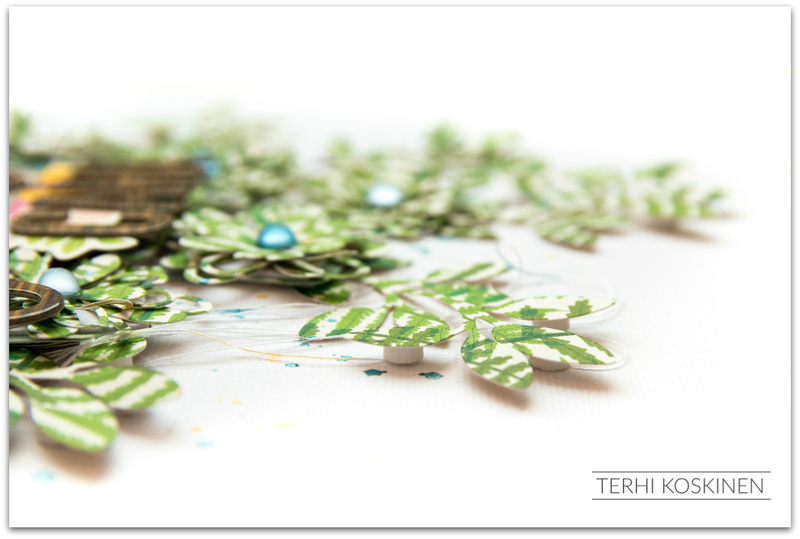 As my photos are quite dark, I wanted to ensure a good balance between the delicate nature of the photos and the boldness of the pattern paper – the free Cloudy Circle Cut File from Paper Issues was the perfection solution! I backed the clouds with the reverse side of pattern paper, GONE FISHING, and then filled the ‘circle’ with SWEET DREAMS. I love how this looks already! Those pattern papers are stunning! With the designer’s ‘rule of 3’ in mind, I decide to use each cut file cloud as an anchor for my sweet photos. I tuck my first of three photos into the cloud on the left side. I also attach the kite from the PRINTED CARDSTOCK SHAPES too, before adhering it all onto my white cardstock base. 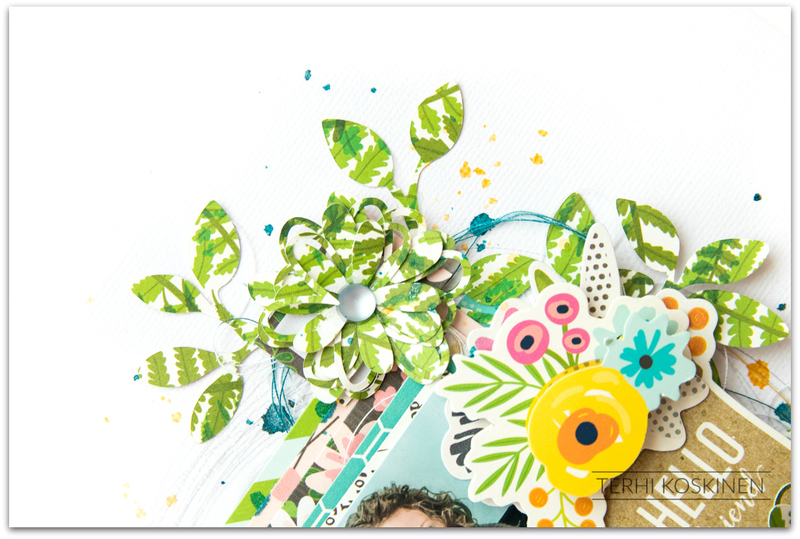 I glue my remaining two photos onto the cut file clouds, and embellish them with those fabulous PRINTED CARDSTOCK SHAPES. I use adhesive foam dots beneath all the clouds to create dimension and add interest. I apply the coordinating GRAYSON THICKERS for my title, which I curve around my starry night scene. The silver Thickers are just stunning! Play time now! I embellish around my circular design, selecting an array of moon, star and clouds stickers. And voila! So much fun, and oh so dreamy too! Here’s a couple close ups for you…. How fabulous is that 6 x 12 ACCENT STICKERS moon?!! Super cute! I hope I have inspired you to create with this beautiful new collection!